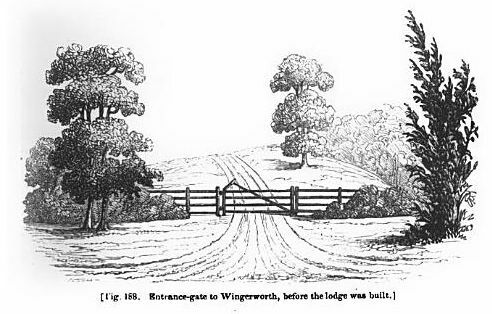 Wingerworth Hall Landscape proposals by Henry Repton. 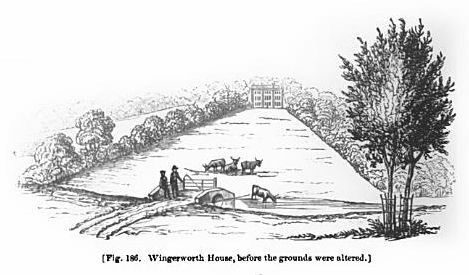 In 1841 JC Loudon6 wrote ‘THE LANDSCAPE GARDENING AND LANDSCAPE ARCHITECTURE OF THE LATE HUMPHREY REPTON, ESQ’ in which there is an ‘EXTRACT FROM THE RED BOOK ON WINGERWORTH IN DERBYSHIRE, A SEAT OF SIR WINDSOR HUNLOKE, BART’ detailing the work proposed by Repton to improve the Hall gardens. His ‘Red Books’ were red morocco bound volumes, written out in a fine copperplate, making recommendations for his client’s estate using ‘before’ and ‘after’ sketches to illustrate the suggested changes. A biography of Humphrey Repton is given elsewhere on this site. Repton describes the house as being on a broad hill in an elevated position and is surprised on approaching the mansion to find that it is larger, richer and more dignified than it appears to be from a distance. Reason given for this is its shape which like any other building of this shape always appears less than it is and the eye is not attracted to it as its length, depth and height are all nearly equal and it is only due to comparison with nearby buildings that the real size can be appreciated. He describes Wingerworth Hall as being copied from the modern palaces of France and Italy with Grecian influences. However, although he thinks it may be necessary to alter the interior as necessary it would be regrettable to alter any of its stately exterior. In his opinion his suggestions will increase rather than diminish its imposing character as a palace. Repton is of the opinion that the stables are correctly sited as he comments that if there were any rooms to the north it would not be desirable to open a view in that direction as it would gain a landscape at the expense of exposure to north winds. In Repton’s opinion the view to the east is worth giving some attention to as he suggests it is defective in two areas. Firstly the ground falls away thus although the lawn may be long to the eye it is fore-shortened such that very little can be seen. His suggestion is that this could be remedied by his proposed terracing. On the horizon are Bolsover and Hardwick whilst the smoke and flame of a foundry can also be seen. In order to draw attention away from these the plan was to have a lake at the bottom and remove some trees, thought to be ornamental at one time, which he considered to be ‘a puerile attempt at mock importance and not worthy to be retained’. The lake is considered to be both a profitable enterprise and a striking feature of the grounds. 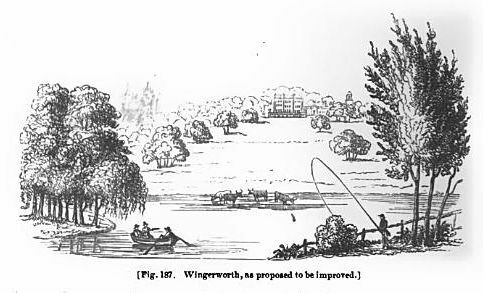 Repton considers that reducing the depth by two or three feet is acceptable if properly managed and thus could be used to supply canals and ‘other circumstances of advantage in this populous area’. Additionally the increase in fish numbers would be a food supply. Therefore he has no hesitation in recommending this change in the scenery. A sketch gives some idea of the effect. Repton voices his opinion on another landscape gardener – ‘There is no part of the art of landscape gardening in which so much absurdity has been displayed by the followers of Brown, as in the line of road which should lead to the house: and before his time, every road was straight along an avenue to the front, and in the shortest line to the high road’. In Repton’s opinion making the road should be as easy as possible and guided by common sense and observation. This way the road should be made natural to blend with the ground contours but choosing the option which presents the beauty and interest. He marked a line from the south, through the plantation to shew (sic) the most interesting scenery when the lake was completed and to travel uphill more gradually than by any other route. The road from Chesterfield is disliked on three counts – too steep, naked and uninteresting but this can be made more easy by introducing curvature when traveling uphill and thus directing the eye to some grass-land beyond the road. which will appear as a continuation of the park. 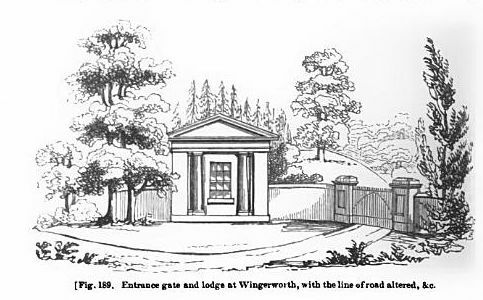 Repton concludes by stating that it would be impossible to list all of the changes which could be made to take advantage of Wingerworth Hall and its surroundings also advising that he would not change recent alterations and would rather concentrate on the major improvements and leave lesser errors to outgrow and correct themselves. He is of the opinion that opening up grounds by the removal of hedges and trees has made it difficult to give such clearance the appearance of an ancient park. The planting of small areas in line with modern gardening can disfigure a lawn but the future growth of larger planted areas was to be looked forward to.